Last night’s Agenda 21 party (oops, I mean Land Trust Town Hall) showed Rep. Wayne Schmidt as the pro-government, anti private property progressive he is. Sitting on a panel hosted by MUCC, surrounded by reps from the Land Conservancy, MEDC, and League of ‘Conservation’ (NOT conservative) Voters; he pressed this audience for support of his bill (HB 5210) to remove the cap on State owned land in the Northern Lower and UP. Apparently, 5 million acres of State owned land is NOT enough. Anyone travel the UP lately? US 2 has miles of restricted access shoreline and wildlife sanctuaries. According to the panel, rivers streams and lakes MUST be protected by the State, and in order to accomplish this, these natural assets must be surrounded by State owned property. The stated objective is to preserve public access to the best places in Northern Michigan for posterity; for a small fee of course. Schmidt and the others claim the land cap hinders this process of ‘conservation’. Having the State and DNR adjust current land ownership to meet the cap restriction is deemed unacceptable, and the State must be free to buy any and all property it sees fit without question or encumbrance. How much is enough? The ‘green agenda’ described in UN Agenda 21 could not be stated more plainly, and Wayne Schmidt projects the ‘legislative’ arm in question. This display of bigger,more expansive and expensive government advocated by him should give all private property owners and Northern Michigan taxpayers pause at the polls this year. We need to elect people that represent us, and not the government they work for. ← Dontcha Just Hate When This Happens? The limits of tyrants are prescribed by the endurance of those whom they oppress, yes? Yes. IT should be noted that there was likely no expectation of the crowd that showed. Push back was there - In force. Jason, we appreciate you guys coming out last night. We did expect you, of course, because you told us you were coming. Surrounded by UN? Really? I'm from Central Lake. Glen's from Traverse City. And I promise, none of us have anything to do with a nonexistent UN conspiracy theory based on a 20+ year old nonbinding resolution. For us, this is about making sure Michigan's 700,000+ hunters have a place to hunt and fish. Thanks for coming out, though. Drew, with all due respect, a former 'Soviet' had a name for those who willingly serve an agenda they are unaware. You may have altruistic motives, but the goal of eliminating private property ownership (the "non-binding" sustainability plank of A21) is made easier by your efforts. A smile doesn't make those efforts any less wrong, or ultimately evil. Private property ownership is one of the most important ways in which a people remain free. If you would like to learn more, I can spend some time with you explaining how the world works. Really? A half million acres isn't enough? That's just the Northern Lower and UP! You folks are doing the work of the UN, like it or not, and your literature reads just like the 21 Charter...like it or not! And did you catch that 'little goal' of completing the Belle Isle "hike and bike" trail to Ironwood? How many private property owners will be affected by that alone? While you're actually reading Agenda 21, and researching it's documented history (as I have); why not ask the 90+ property owners along the Boardman River how they feel about your "naturalization" project that destroyed their home values. Is it your intent to "naturalize" ALL Michigan watersheds? That's a lot of private property you want to manage to your suitability! And by the way, just how can a "non-existent" conspiracy theory be "non-binding"? I checked out MUCC Web site and read this. (Gov. Snyder wrote that he would encourage the DNR to act swiftly in creating the plan and encourage the legislature to uphold its end of the bargain by removing the land cap when it approved the plan. The fact that Snyder is apparently involved and possibly put Wayne Schmidt up to the creation of this bill is enough to draw suspicion, Snyder has been supporting several leftest agendas, plus he is involved in federal land grants, I don't know much about the land grants but it is part of implementing Agenda 21 through federal programs. I'm not positive but I thought I read someplace that Schmidt was scheduled to BS us at Forest Home Twp. Hall on the 17th ? It would be nice if everyone had a copy of your above topic. What I don't like about Schmidt is he comes to us after he submitted the bill, also after he colluded with special interest, then at the Acme meeting they didn't give a dam what we thought, if he did he would have got all our input before creating the bill, but he didn't do that, at the meeting they were telling us what they are doing, he is obviously not representing the public. A bill that would nullify Agenda 21 in Kentucky passed through the Senate by a wide margin last week. SB31 passed the Senate on Feb. 11 by a 32-5 margin and will now move to the House for consideration. “The people of Kentucky don’t want international groups dictating to us what environmental policy should be,” bill sponsor Sen. John Schikel told WUKY radio. The United Nations passed Agenda 21 in 1992 at its Conference on Environmental and Development. The global initiative encompasses a wide range of programs meant to promote “sustainability.” It works its way into the U.S. system through a back door strategy, targeting local governments. Objections to Agenda 21 include violations of personal property rights, the erosion of state and local authority, and binding of the United States to international agreements contrary to the U.S. Constitution. SB31 was referred to the House State Government Committee. If you live in Kentucky, contact your representative and ask him or her to support SB31. You can find House contact information HERE. Also contact House State Government Committee members and ask them to pass SB31 out of committee so the full House can consider the legislation. You can find committee members HERE. Wayne Schmidt Red Flags, What I see after a few minutes of research. He voted for the Medicaid expansions, I believe he voted for common core. Attended 2 Leftest Colleges and more. Granted He has an impressive service record & voting record for the most part, He has crossed all the Ts and dotted all the Is So we would see him as a conservative, but I feel he is courier building, for his own political aspirations and his agenda is not in line with our founders principles. What I notice is the fact that W. Schmidt was closely involved with a lot of Traverse city's planing, he had to rub elbows with the folks of ICLEI Agenda 21 planers over and over again, yet I can't find anything that would suggest that Schmidt is against this organization or has done anything to get them out of Michigan. I for one don't trust Schmidt and I'm entitled to my opinion, We most certainly don't need another Howard Walker in the US senate, we need real conservatives, Schmidt is not my kind of conservative. We have to make sure the DNR Land Cap remains in place. Plus I think we need legislation to rein in the DNR and remove them from the real estate business, this agency is way beyond what it was intended to be. The State land is our land not the DNRs and they are over regulating, infringing on our use of it, plus they're selling off our resources without our consent, the millions they bring in yearly selling off our resources, does not help reduce or eliminate our land taxes, they allays find a way to squander the money. 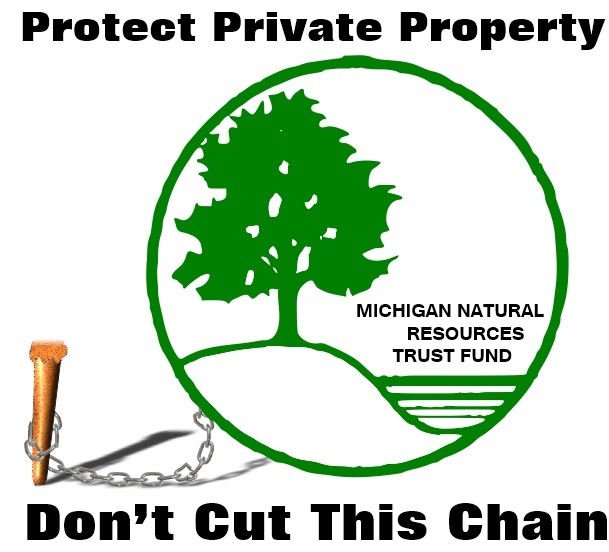 The DNR is working for the robber baron's, Lift the Cap, Hell No!